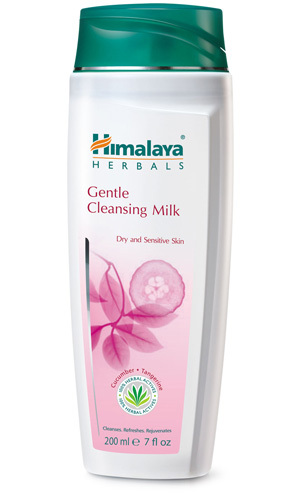 Himalaya Herbals Gentle Cleansing Milk is a unique formulation specially designed for dry and sensitive skin that removes dirt, makeup and impurities, without leaving your skin feeling taut or stretched. Soap Nut and Tangerine gently cleanse and refresh, while Cucumber, a natural skin conditioner, hydrates and cools, leaving your skin feeling thoroughly cleansed and soft. This product is free from liquid petroleum and its by-products, phthalates and synthetic colors. Apply a small amount of Himalaya Herbals Gentle Cleansing Milk onto a cotton pad and wipe all over face and neck. For best results, follow with Himalaya Herbals Gentle Soothing Toner.